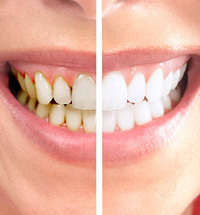 Are you self-conscious about the dark stains on your teeth? If you are, you’re not alone. 80% percent of dental patients express the same concern. White, healthy-looking teeth options are available to everyone. This form of whitening is done within the comfort of your own home. Simply use your custom fitted tray and fill it with the hydrogen peroxide gel we give you and notice results within just a few hours. Whitening results are on average 5 shades lighter and full results take about 2 weeks to complete. Tooth whitening is all about the rejuvenation of your smile - look healthier and feel more confident. A person with a healthy smile is more likely to smile, talk and laugh, and express more of who they really are. Whether for a job interview, graduation, first date or your wedding, we want to help you feel good about yourself and make a great first impression. Notice your teeth become 6 to 10 shades lighter after just one hour of Zoom™ whitening procedure. Zoom™ whitening is not only fast, but is safe, effective and convenient. Contact us to learn more about how to get a whiter, brighter smile.